A year since opening on Grange Road, Findon, Cibo Locale has demonstrated that, while still serving a great coffee this venture is so much more. Stuart Road at Dulwich is the site for the second instalment of the Cibo expansion – Cibo Locale. 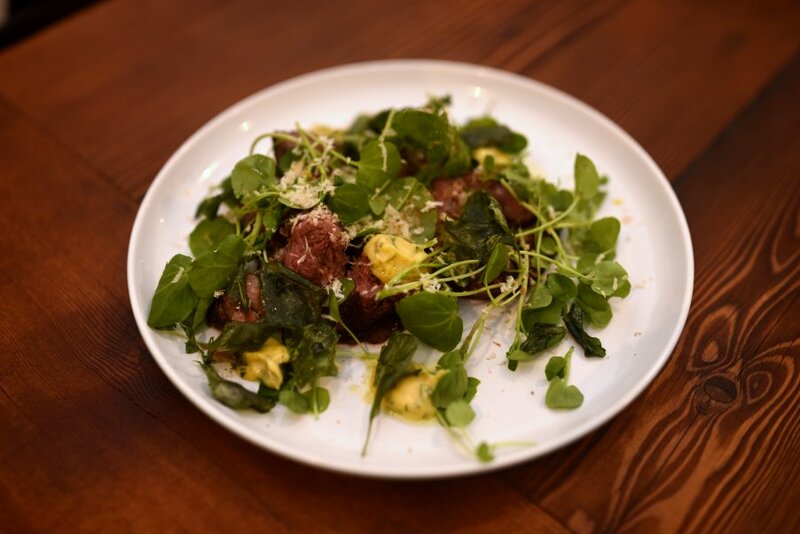 Breakfast and lunch are on offer here daily; however the purpose of our visit was to explore the dinner menu created by Chef and Creative Consultant, Billy Petropoulos, currently only offered on Friday nights. The menu is divided into sections – snacks, smaller and larger plates. The menu embraces the ‘sharing’ style of dining that is becoming increasingly popular. This is good because the menu presents so many enticing choices it is difficult to choose. Lucky for us on this occasion, no decisions were required as we worked our way through the entire menu! 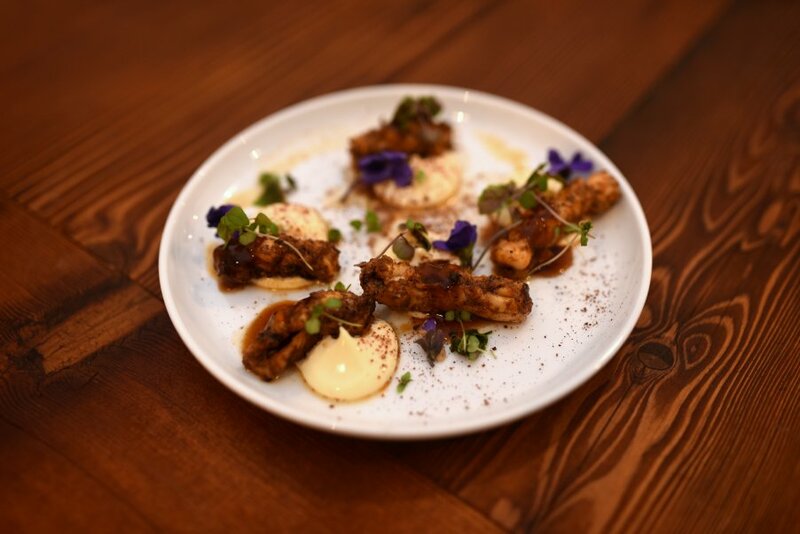 The highlight of the snack section was BBQ Calamari, each tender curl featuring a deep smoky flavour accompanied by a tangy aioli. Other snacks were a delectable plump Crumbed Green Olives filled with whipped feta and complemented by a tomato sugo and a series of pickles featuring kim chi and a duo of caper berries and radishes that were light, fragrant and moreish. The ‘smaller’ plates are where the menu really hits its stride. 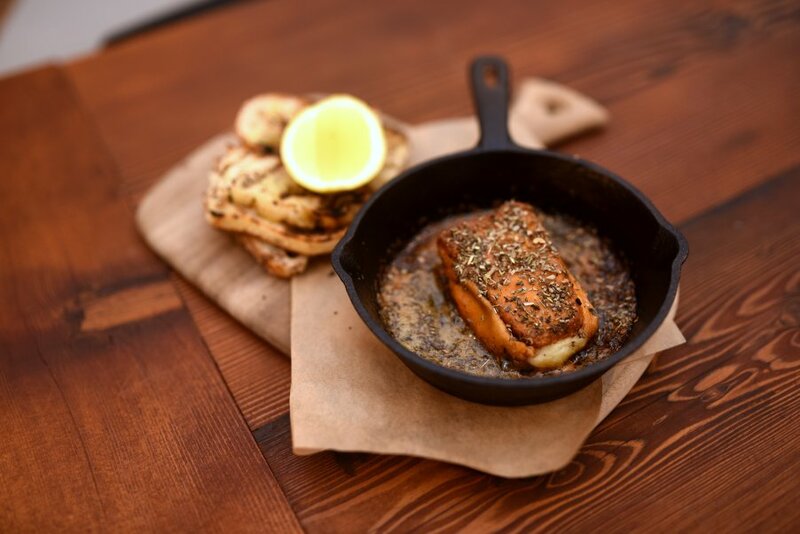 Saganaki Fried Cheese presented in a cast iron skillet fried with organic honey, gives a delightful sweet dimension this salty favourite. 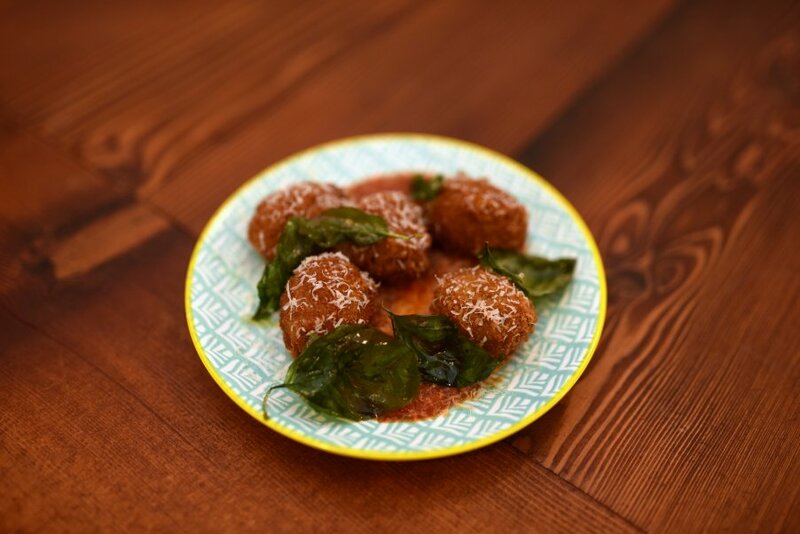 A plate of Croquettas placed on the table brings the delectable fragrance of truffle with them. Each parcel has a crisp, golden casing and a pillowy soft filling flavoured with porcini and the anticipated truffle. 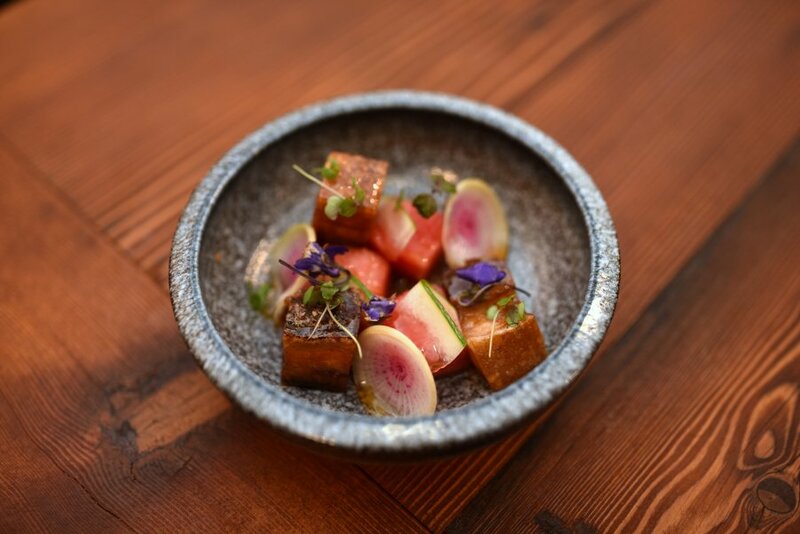 Cubes of Sticky Porkbelly are juxtaposed with pieces of pickled watermelon producing a delightful flavour combination. Bathed in caramel and garnished with radish and edible flowers, it tastes as good as it looks. 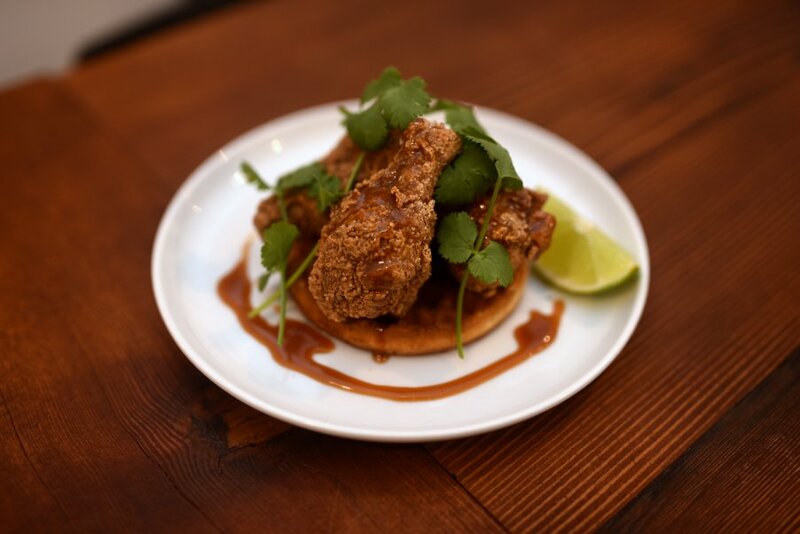 Crunchy Buttermilk Fried Chicken Wings sit atop a crisp waffle, drizzled with salted caramel. The whimsical American favourite is a surprising addition to this menu and is sweet, salty and satisfying. 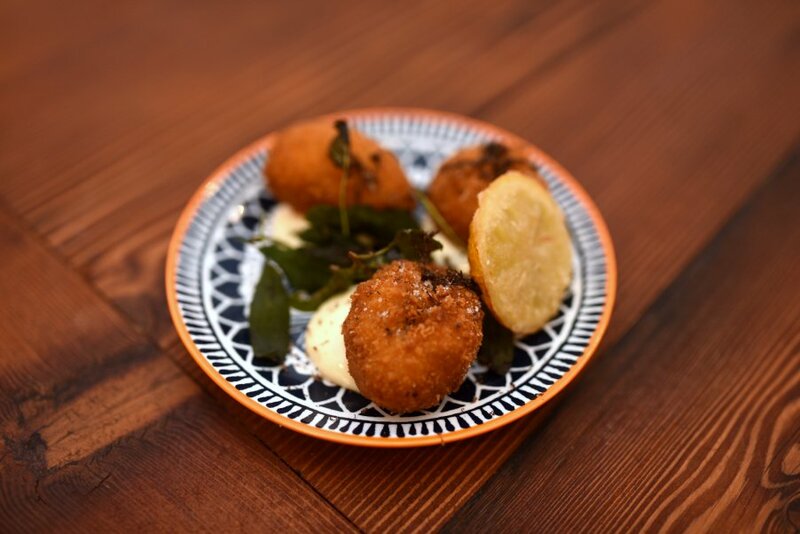 The larger plates feature bold and comforting flavours. A Housemade Pappardelle, thick ribbons of pasta stirred through chunks of tender slow cooked beef short rib, topped with parmesan and crispy sage; sliced Black Angus Steak dolloped with creamy béarnaise, accompanied by thick chips; Snapper and Clams in saffron broth evoked flavours of the sea with its unusual inclusion of sea vegetables. The resounding favourite main plate was a take on Peking duck pancakes. 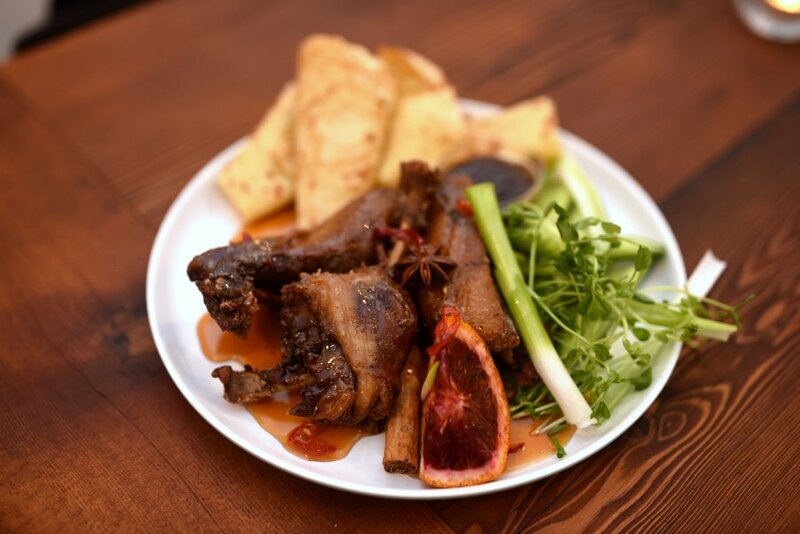 The Crispy Tea Smoked Duck has been braised, smoked and then fried to crispy perfection and it shreds on the touch of a fork. It is smothered in a blood orange caramel sauce studded with star anise and cinnamon, ready to be packaged up in house made pancakes and the requisite hoi sin sauce and spring onion spears. To finish, a fluffy Raspberry Soufflé stands proud risen high in its ramekin next to the accompanying house made Baci ice cream. 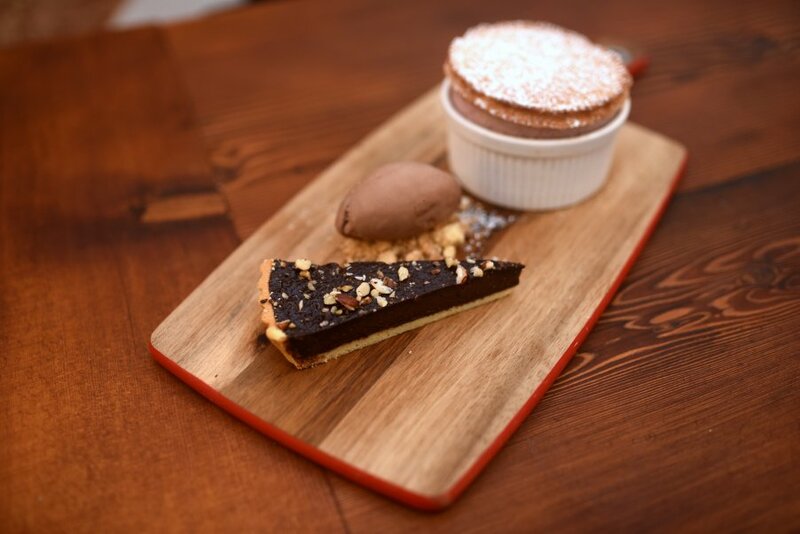 Also on offer for dessert is a slice of Hazelnut Tart – a smooth, chocolaty filling encased in a crisp pastry shell. Neither dessert is overly sweet, which is necessary considering the underlying sweet elements in the previous courses. 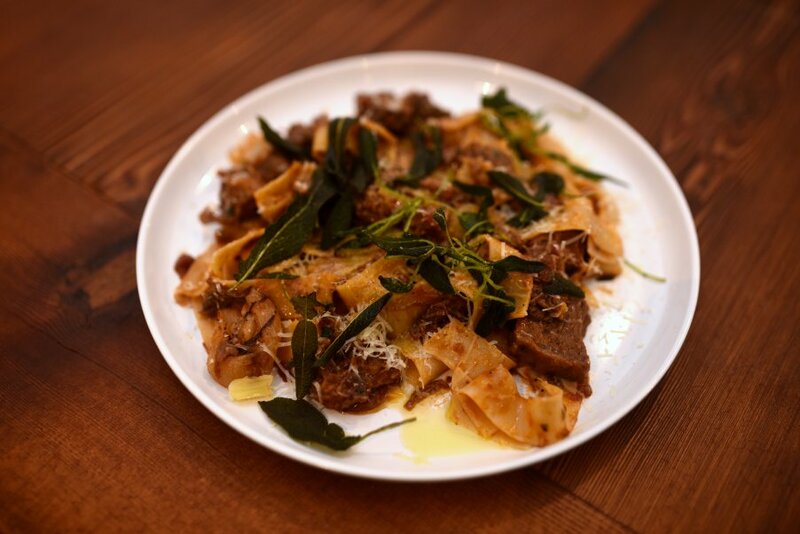 Themes of caramel, crispy sage and citrus run through this strong menu that hardly falters. 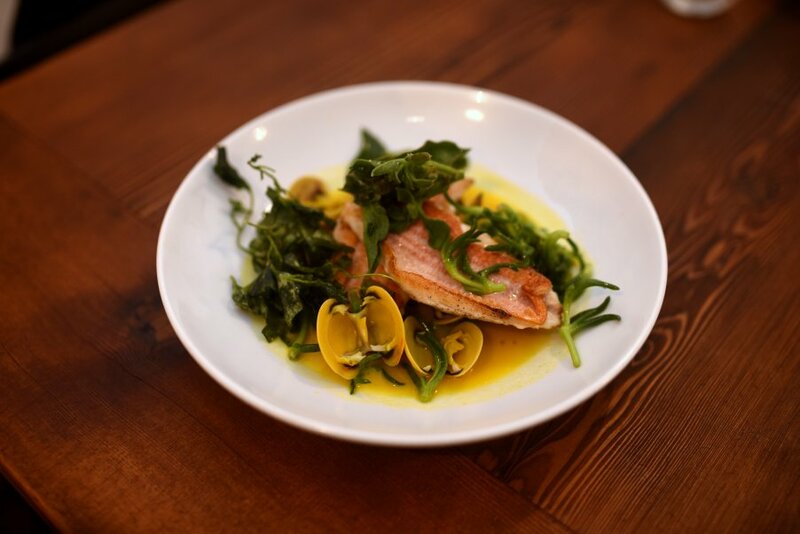 Each dish delivers punchy flavours, a variety of textures and complementary components that make each dish a joy to eat in their own right as well as combining into a wonderful meal. Let’s hope a plan to extend dinners to additional nights of the week goes ahead because I want to return again and again.